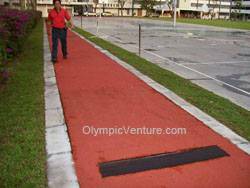 Installed long jump rubberized running track for Jit Sin Chinese School, Bukit Mertajam, Penang (June 2009). Apply and lay 1 tennis court using Fibre Re-inforced and finished with Plexipave in Air Keroh Country Club, Melaka (June 2009). Apply and lay 1 outdoor futsal of Fibre Re-inforced Cushion Court in Sri Manjung, Perak (July 2009). 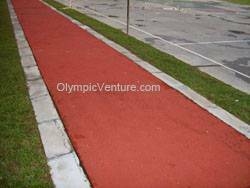 Installed 1 Olymflex Rubberized futsal court for Army Camp in Johor Bahru (July 2009). Refurbished squash court in Palm Garden, IOI, Kuala Lumpur and draw futsal playing lines, plus supplying goal posts and install partition netting (July 2009).